What’s the difference between an internal and external motivation? Are our internal motivations actually external? A behaviorist professor of mine says YES; even reaching for a drink of water is an action driven by an external motivator, or stimuli. You might be thirsty (what you would expect to be an internal motivator), but you are thirsty and motivated to drink because of your surroundings, perhaps your dry environment (which is an external motivator). According to this professor, NOTHING originates as an internal motivation. Traditionally, cognitive motivation research has supported a polarized relationship between intrinsic and extrinsic motivation whereby they are mutually exclusive; the presence of an extrinsic motivation diminishes intrinsic motivation (Moos, 2010). For example, if a learner has an internal motivation to research the history of funeral photography, it will eventually diminish if a teacher threatens with a bad grade if they don’t write a 5 page research paper about it. Or, if an over zealous homeschool mom gives her son an “atta boy!” every time he jots down what he’s learned in a nascent form of a research paper, he will quickly stop writing, and perhaps stop researching all together. Lepper et al. (2005) argue, however, that intrinsic and extrinsic motivation are not as mutually exclusive as this; their relationship is actually orthogonal, with both variables being necessary for optimal learning to occur. 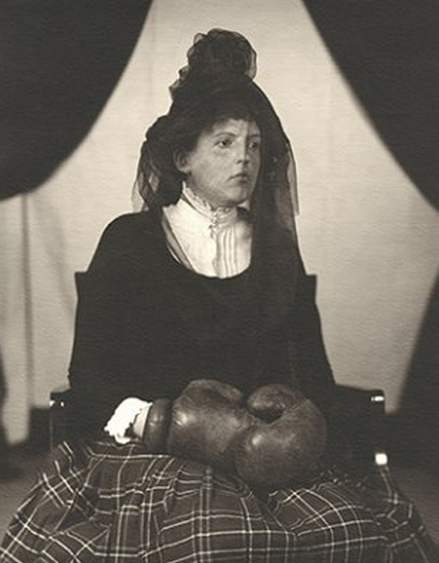 Lepper’s research illustrates that a learner might engage in an activity out of a personal interest (an intrinsic motivation to understand why this woman is posed wearing a black veil and boxing gloves) while at the same time performing and completing a related task within a given timeframe for a high-scoring grade (the extrinsic motivation of completing a research paper on funeral photography within 2 weeks could be the catalyst that actually gets the paper finished). Lepper et al. assert that both are necessary for optimal learning. Moos (2010) summarized the traditional definition of intrinsic motivation as “an internal desire to engage in a behavior due to pleasure, interest, enjoyment, and/or challenge” (p. 1641). In contrast, external motivation has traditionally been defined as a desire to engage in “behavior due to external incentives, such as money, grades, and praise” (Moos, 2010, p. 1641). Studies of intrinsic interest have grown concomitantly with cognitive science since the 1950s (Lepper et al., 2005; Bransford et al., 2000), in contrast to the previous dominating behaviorist theories which focused on external motivation. Behavioral psychology explains human actions as responses to external stimuli, crediting behaviors as reactions to environmental situations (Bransford et al., 2000). From a cognitivist perspective, the construct of intrinsic motivation is necessary to explain some of the phenomena of unobservable mental states that manifest themselves as behaviors. Intrinsic motivation helps to explain what happens inside Skinner’s black box. Previous What Thwarts Interest? Stops Motivation?